To wander; to stray: The hikers were aberring from the main trails in order to see the wildflowers in the field. 1. A reference to something that is the worst kind or extremely wrong: Hugo said that the accusation that he was quitting his job was arrant stupidity. When Jim forgot to wish his sister "all the best" on her birthday, she felt he had shown an arrant rudeness. 2. 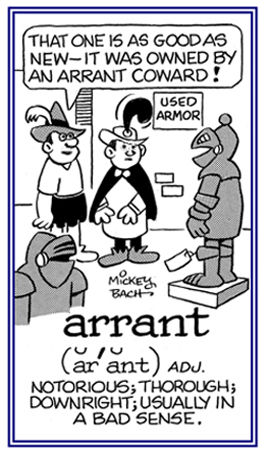 Etymology: the term arrant was originally a different form of errant, and it had the meaning of "wandering", as in the phrases knights errant and errant thieves which referred to both types being "on the move". 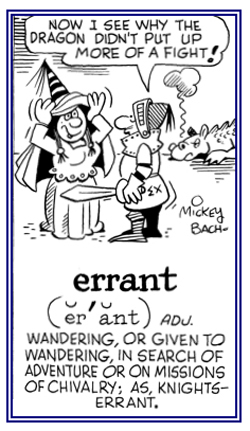 Then errant was applied to knightly wanderers, and the spelling arrant was applied to "knavish drifters" referring to "outright, confirmed, manifest", and being "notoriously bad" or "unacceptable". 1. To go astray in thought or belief; to be mistaken; to be incorrect: Sonia erred in her thinking that her shopping was completed. 2. To go adrift morally; to sin: The reverend cautioned his congregation not to err in their daily behavior. 3. To drift off from the true course, aim, or purpose: The captain erred when he directed the ship to sail south instead of east to the island. 4. To wander from the right direction; to lose the way from the true course or purpose: Despite her promise to stop smoking, Laura was erring from time to time and sneaked some smokes. 5. To miss the right way, in morals or religion: There was an emphasis at the religious college that students should not err in their commitment to their faith and that they should live morally. 6. To deviate from the path or line of duty: The soldier erred in achieving his responsibility as indicated by his superior officer. 7. To stray by design or mistake: During the drive to the city, William noticed that he was erring by taking the wrong road. 8. To make a mistake; to commit an error: The members of the group erred in their estimate of how long it would take to complete the project. 9. To do wrong from ignorance or inattention: The child erred in her chores because she was distracted by playing with her puppy. 10. To wander; to ramble: Jacob enjoys erring in old cities, admiring the narrow streets and interesting shops. A tendency to make mistakes or errors: Hank's repeated errableness is going to get him into trouble one of these days. Wandering, meandering, or roaming: Lester enjoyed the most errabund holiday of all his previous summer holidays. 1. The fallibility of or the probability of making blunders: The errancies of the football team was predictable because they had not practiced sufficiently. 2. 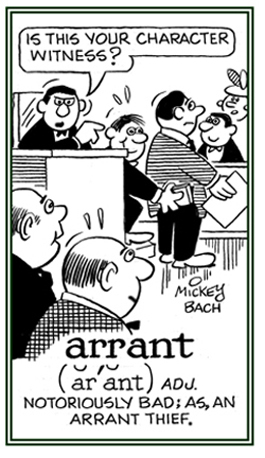 Incorrect or morally wrong behavior: Hans confessed his errancy and begged for forgiveness when he took money from his father's wallet when he was asleep. 3. A tendency to do wrong: the propensity for making mistakes or acting improperly: The puppy was always exhibiting errancies when she frolicked in the muddy water. 4. Holding views that disagree with accepted church doctrine; especially, a disagreement with Papal infallibility: Because of her errancies, Francis was asked to leave the church. 1. Relating to a deviation from a regular or a proper course; straying: Fortunately the mother saw her errant child leaving through what was supposed to be a locked gate and wandering over to the neighbor's yard before he went too far away. 2. Characterized by behaving improperly: Teresa's errant husband finally arrived home after having consumed too much alcohol at the local bar. 3. Pertaining to a journeying or traveling in quest of an adventure: Ralph was considered to be an errant traveler who spent his summer vacations hiking in a different national park every year. 4. 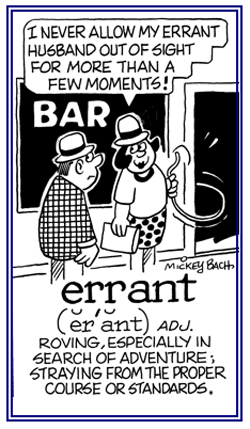 A reference to an aimless or a lightly changing manner: The errant breeze was blowing in the area. © ALL rights are reserved. 1. A reference to behaving in an unacceptable manner: Running into the house with muddy feet is a very errantic activity and it is not at all the right thing to do. 2. Descriptive of anyone or anything wandering from an intended course, or not reaching an intended destination: When the engine died, the car coasted in a most errantic manner down the hill and stopped before hitting a tree. 3. Related to roving in search of adventure and romance: Jason enjoyed a most errantic summer holiday with just a backpack and a train ticket. A way of life in which a person travels around in search of new adventures: Mike's cousin always planned to live a life of errantry in other countries.